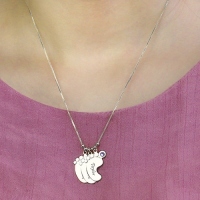 Moms love anything that celebrates their children, not to mention this lovely Baby Feet Necklace of top quality, meant to last a lifetime. Engrave up to five baby feet charms with the names or dates of the children and birthstone on each pendant. Celebrate the miracle of birth with this commemorative necklace. It is a great gift for mom at any time of the year like birthdays, Mother's Day, or Christmas. Any mom is sure to love and appreciate this necklace. This adorable little charm necklace is top quality, meant to last a lifetime.